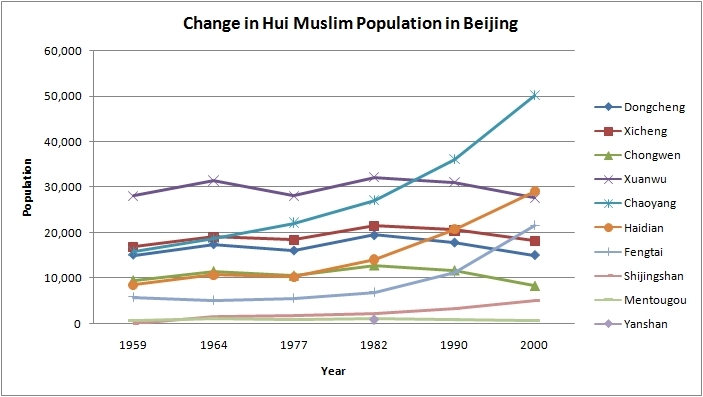 As I mentioned in one of my previous posts that I would be posting quantiative data about Muslims in Beijing. (This of it as a Razib style post.) The table below shows changes in Hui Muslim population over time. The source of information is the same as before (Beijing’s Hui Muslim Community). One can definitely see some general trends e.g., while the Muslim population has increased by 75,000 in terms of absolute numbers but its percentage of the overall population has declined. Many districts show a decline in Muslim population, Chaoyang, Haidian and Fengtai are exceptions though. Another interesting thing is that if we compare the absolute numbers of many districts in 1959 nad 2000 then the numbers are more or less the same. Since these numbers should increase by natural birthrate then this actually means a relative decline because of migration. Given below is the same data but in a graphical form to make comparison between different districts and eras more comprehensible. So, what do you attribute this decline to? salam Tugrul and welcome to the blog, There could be combination of factors. One is people moving from one district to another district. This seems to be the case for Chaoyang. Another reason could be the assimilation of Hui Muslims into the larger population especiall during the cultural revolution. Thus a decline is observed between 1964 and 1977. Another reason could be migration to other areas. Are there any Han Muslims in China? They are the largest ethnic group. But no data seems available about conversions among Han. I had always believed there were over 10m Muslims (mostly Han) in the coastal provinces of China. Nobody knows how many muslims are there in china!